"Is brand management part of marketing or is marketing part of brand management?" I have been asked this question many times throughout my 30-year career in brand management and marketing. My answer is always, "Yes." Yes, brand management is a part of marketing, which can also include marketing research, product development, product management, advertising, promotion, package design, pricing, distribution, public relations, trade relations, direct marketing, social media marketing, brand licensing (when it is separate from brand management), customer relationship management, retail design, merchandising, sales support, trade show management, and sometimes (but rarely) business development and sales. And yes, marketing is a part of brand management, which can also include brand strategy and positioning, brand identity development, brand equity measurement, brand pricing and distribution strategy, brand extension and the largest non-marketing pieces, customer touch point design and inside-out brand building, which typically impacts employee training and communication, corporate culture, recruiting criteria, common measures, organization design, process design, customer service design, recognition and reward systems and organization investment priorities. Consider marketing and brand management as two separate functions that have a significant amount of overlap. 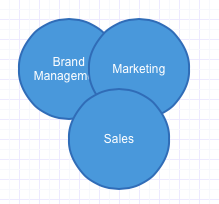 Picture a Venn diagram with two intersecting circles, one being marketing, the other brand management. In some organizations (typically houses of brands), product management and brand management are combined. In other organizations (typically branded houses) these functions are managed separately. Some organizations have one person in charge of brand management and marketing, while in other organizations, these two functions are managed separately. Some organizations combine brand management, marketing and organization strategy under one person at a very senior level. While others keep organization strategy separate from brand management and marketing. Sometimes, sales is a part of the mix at a very senior level, while often it is not. And then there is corporate communications and public affairs. This is occasionally part of marketing, but more often it is managed separately. Finally, because of brand management's impact on organization design (brands must deliver on their promises), there are a few rare organizations that have combined brand management and human resources at senior levels. Clearly, the reason people have this question is because the answer to it can vary across organizations depending on the organizations' goals, business models and depths of understanding of these functions. valuable post! I really like and appreciate your work, thank you for sharing such a useful information about human resource corporate communication strategies, keep updating the information, hear i prefer some more information about jobs for your career hr jobs in hyderabad . Nowadays marketing has become so important that noone can promote their business without it. If you are looking for Best SEO Agency,then you can contact eliteinformationtech for further details. Thank you for sharing blog about branding strategy. If you are looking for SEO Services Jaipur then, please visit, weblinkbuilding services.